I’ve got a couple of channels on GBP/AUD and EUR/USD in today’s intraday charts update. These channel setups are special, though, since they’re coupled with Fibonacci plays. That there ascending channel in GBP/AUD’s 1-hour chart ain’t exactly new since we first identified it way back on November 13. Back then the pair was testing the channel’s support area, which was below 1.7160. And we were lookin’ to go long on the pair at the time. However, I also warned y’all back then that if y’all weren’t gangsta enough, then y’all may wanna wait until a break past 1.7230 before going long. Well, whether you jumped in with a long at the channel’s support area or after the pair cleared 1.7230 doesn’t really matter now since the pair surged higher until it found resistance at 1.7590. That’s a whole lot of pips away! So congratulations if you were able to ride the upswing. Aww, yeah! For today’s play, we’ve got a Fibonacci retracement setup. 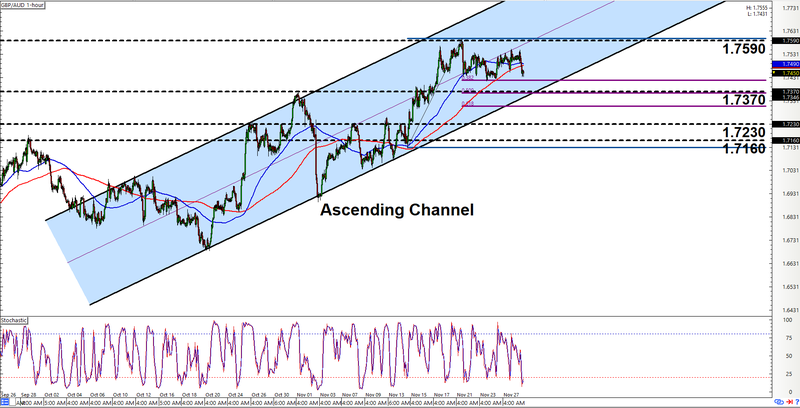 After all, the pair did find resistance at 1.7590 and the pair appears to be dipping towards the channel’s support area, which should be somewhere around 1.7370. And incidentally, the channel’s support area also sits right smack on the 50% Fibonacci retracement level. As usual, however, keep in mind that the risk for a downside channel breakout is there, so be ready to bail yo longs if the pair breaks lower past 1.7230. 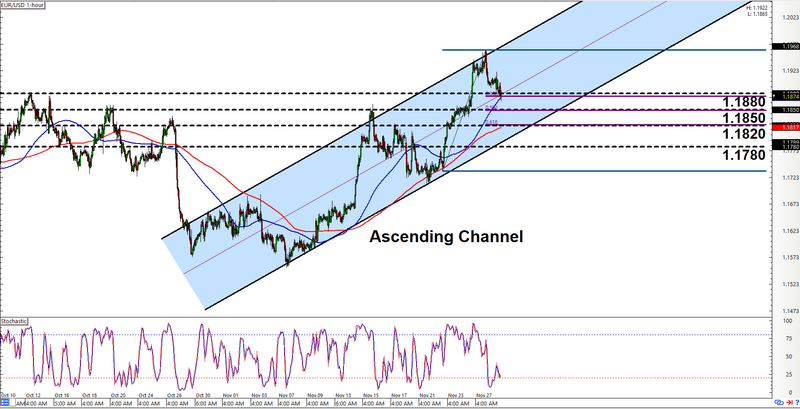 If you’re looking for something more fresh, then check out that there ascending channel on EUR/USD’s 1-hour chart. Yeah, price action on the EUR/USD is admittedly similar to that of GBP/AUD’s. There’s also even a Fibonacci retracement setup bundled with the channel setup. This one is a bit more complicated, though, since all three retracement levels are in play, given that the 38.2% levels lines-up with the area of interest at 1.1880 while the 50% level sits right smack on 1.1850. As for the 61.8% retracement level, it also lines up with 1.1820. Since all three retracement levels are in play, then y’all may wanna prepare for a potential bounce from any of ’em. And looking at stochastic, it looks like 38.2% is not very likely to hold and 50% may be next since stochastic is pointing back down again. And in the unlikely scenario that all retracement levels fail to act as support, then y’all may wanna think about abandoning ship, especially if the pair stages a downside channel breakout and then takes out 1.1780. In any case, just make sure to practice proper risk management as always, a’ight?